WYRMWOOD: ROAD OF THE DEAD: Attack Of The Sci-Fi Action Zombies – Schlockmania! If you’re doing a zombie movie in the post-Walking Dead era, you’ve got to give the audience more than the usual flesh-chomping same-old. It’s no longer enough to emulate George Romero flicks or 28 Days Later: the current zombie movie cycle has reached a place where it is necessary to crossbreed the subgenre with other styles of storytelling to keep things interesting. 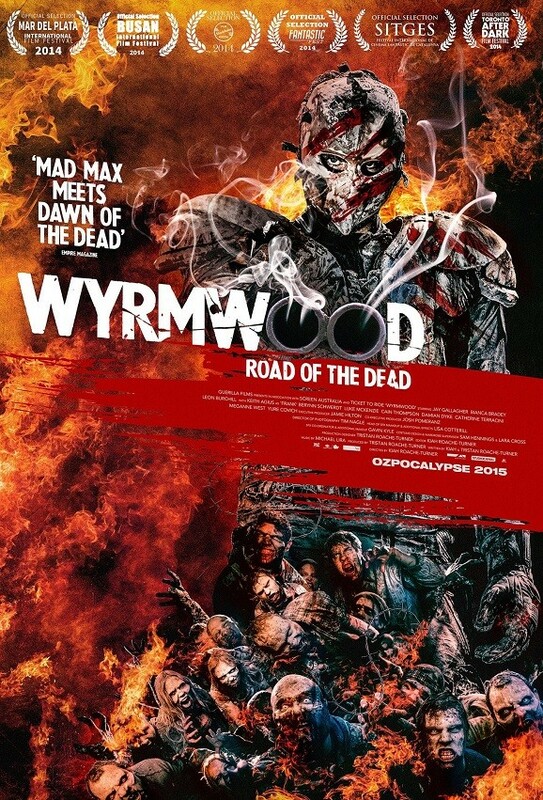 A recent film that has done this type of crossbreeding well is Wyrmwood: Road Of The Dead. This Aussie import not only brings in a Mad Max action vibe, it also throws in some unexpected and welcome sci-fi elements. Though it is laid out in a tricky cut-up style, the plot of Wyrmwood is essentially a road movie. Some sort of strange outer space event causes a zombie plague and Barry (Jay Gallagher) learns about it when he gets a panicked call from his sister Brooke (Bianca Bradley). He sets out to find her, eventually teaming with good-natured goof Benny (Leon Burchill) and mechanical genius Frank (Keith Agius) to fight his way there. Meanwhile, Brooke is captured by soldiers that usher her into the lab of a gonzo scientist (Berynn Schwerdt) doing some unorthodox experiments with zombies and survivors. Wyrmwood: Road Of The Dead delivers all the blood-drenched excitement the premise suggests. It’s as much an action film as it is a horror film, with the story unfurling between or in the midst of a series of kinetic setpieces where bullets and punches fly alongside the blood-spatters and body parts. It’s the first film from the brother team of Kiah and Tristan Roache-Turner – Kiah directed, Tristan produced and both scripted. Both were clearly raised on the early work of Sam Raimi and Peter Jackson, as their film taps into the half-cartoon/half-splatter tone with snappy editing and mobile camerawork that draw the viewer into the heart of the onscreen carnage. 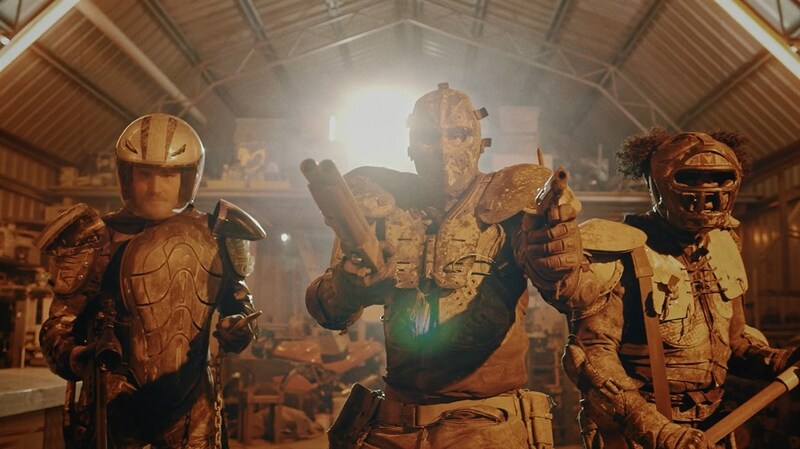 However, the big surprise with Wyrmwood: Road Of The Dead is that it as ambitious as it is energetic, with the Roache-Turners using their cinematic debut to experiment on a number of levels. The film has been praised for its nods to Mad Max – the heroes wear armor to fight zombies and there’s a car-stunt sequence – but it also incorporates some wild science-fiction angles via the mad scientist subplot, leading to some unpredictable plot twists that add a new level of excitement to the third act. They also weave in cool little touches, like how the zombies breath a fuel source that can fuel cars in the film’s post-astral event world. Wyrmwood: Road Of The Dead also experiments daringly with tone, veering from action/horror toughness to slapstick comedy to intense drama – sometimes covering them all in the same scene. All the protagonists, even comic relief Benny, get moments of quiet drama that add a texture that gets the viewer invested in what’s happening to the heroes. The performances make the tonal shifts work: Gallagher does fine work as the grim main hero, Bradley offers an energetic and convincing interpretation of the “tough chick” archetype and Burchill handles the deadpan dumb-guy humor well. Elsewhere, Agius offers a likeable regular-guy variation on the mechanical genius and Schwerdt creates a memorably freaky variation on the stock mad scientist character. In short, Wyrmwood: Road Of The Dead is one of the true gems of the modern zombie flick because it cleverly mixes in other genres and juggles a variety of tones with surprising skill for a first-time effort. If only the rest of the current zombie brigade worked as hard as this film does.